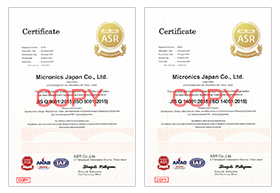 Integrated Management System - Social Responsibility - MICRONICS JAPAN CO.,LTD. MJC has organized its quality and environmental initiatives into a total management system (TMS) through which we strive to raise customer satisfaction and to preserve the local and global environment. MJC has established an TMS consisting of a quality management system (QMS) based on ISO 9001 requirements and an environmental management system (EMS) based on ISO 14001 requirements to ensure the performance of the following items in all business operations—the development, design, manufacture, sale, and maintenance of semiconductor measurement units and semiconductor/FPD testing systems—grounded in our principle of QDCCSS*. In this way, we meet requirements and continually improve and maintain effectiveness. Act with the aim of preventing non-conformities and improving/enhancing business operations, for the purpose of maintaining product quality, ensuring observance of delivery times, and controlling costs, in order to earn customer satisfaction. Act with the aim of preserving the local and global environment through energy savings, reduction of resource consumption, promotion of recycling, reduction of waste, management of chemical substances, prevention of environmental pollution and the practice of environmental protection, and product quality improvement, in order to leave a beautiful Earth to our descendants. Goals shall be set within a range that is technically and economically feasible, based on the purpose of each management system and significant environmental aspects. A framework shall be established to conduct periodic reviews of progress and degree of attainment. (2)Understanding the EMS, increasing awareness of and qualifications associated with the environment, and recognizing the importance of preserving the local environment. Employees shall understand the TMS specified in the integrated manual and shall follow these provisions. The Company shall comply with laws and ordinances, regulatory requirements, and agreed upon quality and environment requirements. It shall also strive to strengthen and enhance management based on the integrated manual and each provision. A framework shall be established to review this Code every year to maintain the appropriateness of the management system. This Code shall be disclosed outside the Company and shared with everyone who works for MJC. MJC has acquired ISO 9001:2015 certification, which is the international standard for quality management systems, and ISO 14001:2015 certification, which is the international standard for environmental management systems.